06.03.2017 - Georgian Foreign Minister Mikheil Janelidze is on his working visit in Strasbourg where he is due to hold meetings with representatives of the Council of Europe, CoE Parliamentary Assembly and the European Court of Human Rights. 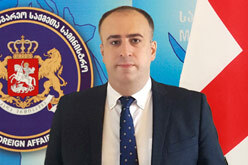 Within the framework of the working visit, Mikheil Janelidze will brief the Council of Europe officials on the reforms the Government of Georgia has carried out in various priority areas. Discussions will also focus on the issues relating to ongoing and future co-operation.